Combine all the seeds, dates, almonds, cacao powder, coconut oil and vanilla extract in a nutribullet or food processor and pulse for about 45 seconds or until it forms a dough texture or starts coming together. Pour the mixture onto grease proof paper and use your hands to form 12 energy balls. Roll in the coconut is desired. Chill for at least 30 minutes before serving. I often put mine into the freezer. 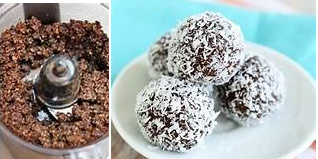 These energy balls are great for Kids and Adults. The healthy fats and protein in these balls will keep your energy and blood sugars steady during the day and your kids. So ideal healthy snacks for teenagers studying or doing exams. Good fats improve brain health and proteins form the building blocks for growing kids and teenagers. 30g of hemp powder contains 12g good quality plant protein that help keep glucose levels steady preventing energy crashes. You will get the hemp powder in most supermarkets now including Aldi.